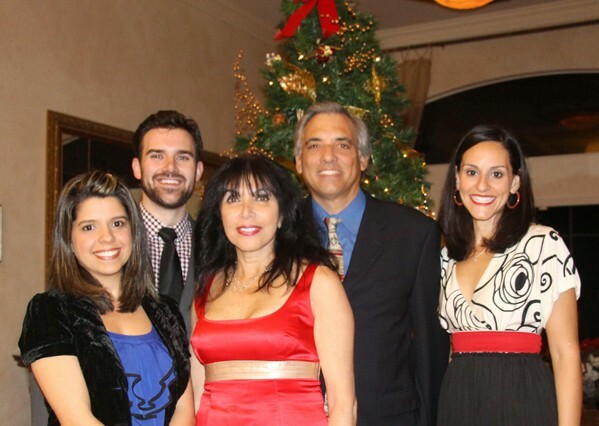 On Dec. 20, 2014 at 7:30 PM, Larry and Ruth Molina hosted 65 members and friends of the Opera Society at a Holiday Party in their home in Plantation Acres. It was gratifying to see not just the regular members, but friends of the Museum of Art and the Friends of the Uffizi Gallery and the Molina’s personal friends get together and enjoy an evening of drinks, dinner and music. The evening began with champagne and appetizers indoor, and from there we moved out doors to the patio, which was festively decorated in honor of the season. The lovely pool area was large enough to accommodate the large group, and the weather was extremely cooperative. Everyone was hungry and tackled the buffet feast, which included London broil, lasagna, penne a la vodka, asparagus oreganato, salad, and chicken francaise. Everyone repaired to the patio deck and had some wine and awaited the performance. The FGO Young Artists, Will Hughes – bass-baritone, Rebecca Henriques – soprano and Marina Paulina Garcia – accompaniest, provided us with a program full of Holiday Songs, Cuban ballads, and excerpts from the Opera. Everyone joined in and tried their hand at singing holiday songs. It was wonderful! Then on to dessert and more conversation and music, and we still manage to collect some greatly needed funds for the Opera. All in all, we have established a great December tradition that we hope will continue for years to come. All the delightful photos are courtesy of our Vice-President for Publicity, Betty Young.